Jason Quintero was in New Orleans with NBA team the Hornets (now the Pelicans) when Hurricane Katrina hit. Due to the damage caused by the storm, the Hornets temporarily relocated to Oklahoma City, which had no NBA team of its own at the time. After a couple seasons in the state’s capital, the Hornets made their return to Louisiana, but the Sooner state left its charm on Quintero, who was in charge of creating fan experiences as the Hornets’ game presentation manager. When Oklahoma City (OKC) debuted its NBA team, the Thunder, in 2008, he readily came aboard to manage entertainment. 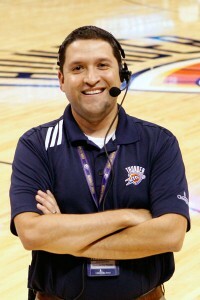 Quintero is responsible for all nonbasketball entertainment aspects of home games at Chesapeake Energy Arena: that means music, lighting, video production, on-court contests, the mascot, blimp operations, pregame and half-time talent, the public address announcer, two emcees, as well as four entertainment teams (the Thunder Girls dancers, Raindrops (kid) dancers, Thunder Drummers, and Storm Chasers). Quintero discusses how he engages new NBA fans with Hispanic Executive. You’ve had a unique experience marketing professional basketball. How does that influence the way you generate excitement for the Thunder? My experience has always been focused on brand building. When the Hornets moved from Charlotte to New Orleans (2002), we had to figure out how to get a football town to embrace a basketball team. When we moved to Oklahoma City (OKC) after Katrina, we had to rebrand the team for that city, where a lot of people had never seen an NBA team play before. We created a “Stinger H” logo that put the emphasis on the team, instead of the city. Then the Hornets moved back to New Orleans and had to start over once again. The “new” New Orleans team was rebranded with a new logo influenced by the local culture. That logo became known as the Fleur-de-Bee. When the Thunder was being launched, and I joined the new team in Oklahoma, all that branding experience came in handy. I was able to bring the new team some tried-and-true methods based on my past experiences. Tell us about some of the innovative methods you’ve used to engage the fans in OKC. One of the ways we engage fans is through texting, giving them a sense of ownership of the show. We use text-to-vote, for example, to choose the music played during the Kiss Cam segments. We also have a text-to-win giveaway, where fans can win prizes such as a signed basketball or even a trip to an away game. How are you incorporating social media into the fan experience? This past season, we used the #WeAreThunder hashtag to encourage fans to show their Thunder pride through photos. We showcased three of the photo submissions during a social media segment. This season we’re going to raise the bar and have fans submit videos of their Thunder pregame rituals and traditions. Despite being one of the smallest markets in the NBA, we have more than 6 million fans across all social media platforms. Our fans seem to really appreciate that we keep them engaged with all aspects of what we do and that we’re invested in the community. How do you connect fans with the players? Thunder players encourage fans to be more active with community involvement. When a tornado ripped through Moore, Oklahoma, Thunder players were on the scene helping with tornado relief. The players have made appearances at schools, hospitals, and fit clinics; served more than 2,000 meals at the City Rescue Mission since 2009; and have given away 36,800 pounds of turkey on Thanksgiving since 2008. How else are you generating fan excitement and support? Upper Bowl Activation is a program designed to help the fans in the 300-level seats (Love’s Loud City) feel more engaged in the fan experience. We give away at least 100 Thunder shirts each game, caught on a dedicated fan camera. Then we have the Storm Chasers, who lead cheers and activate promotions and contests. For half-time programs, we book more than 30 national acts—among the highest numbers in the NBA. One of our most popular promotions is the MidFirst Bank half-court shot contest with a prize of $20,000. How do you measure fan loyalty and the success of your efforts? Our season-ticket retention rate is among the best in the league, but I measure fan loyalty beyond ticket sales. One of my favorite parts of this job is seeing the crowd’s reaction to the hard work and creativity of our staff. The reaction of seeing 18,000 fans responding to a video or mascot skit is priceless. Even in the off-season, people are wearing Thunder gear everywhere I look.